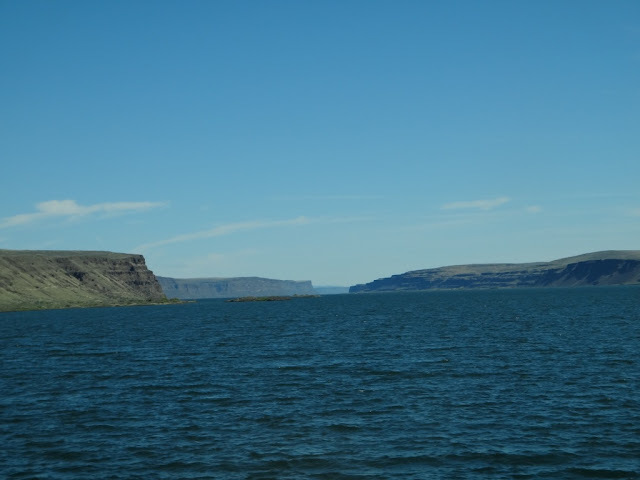 Photograph 1 - This lake appeared all of a sudden as we were driving to Seattle. Looked like a flooded Grand Canyon. Near Coulee City, Washington. 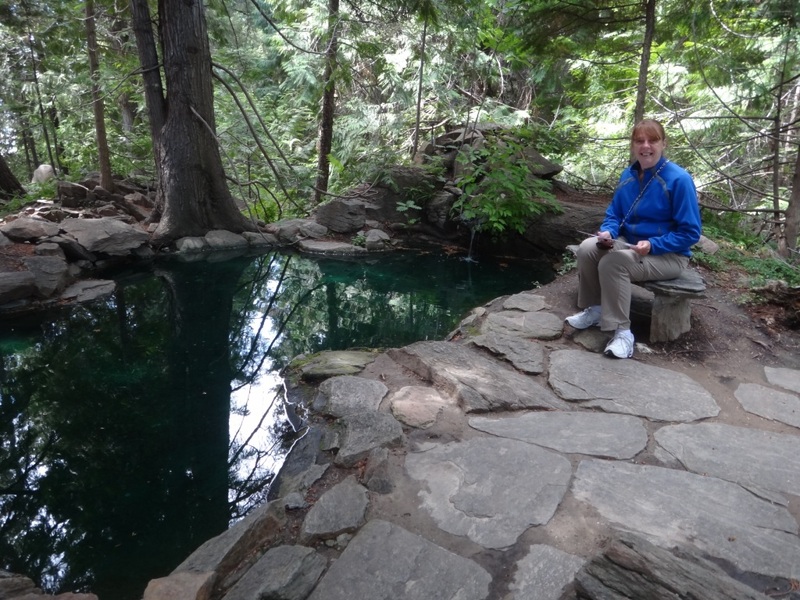 Photograph 2 - This is one of the beautiful manicured pools within Ohme Gardens, Wenatchee, Washington. 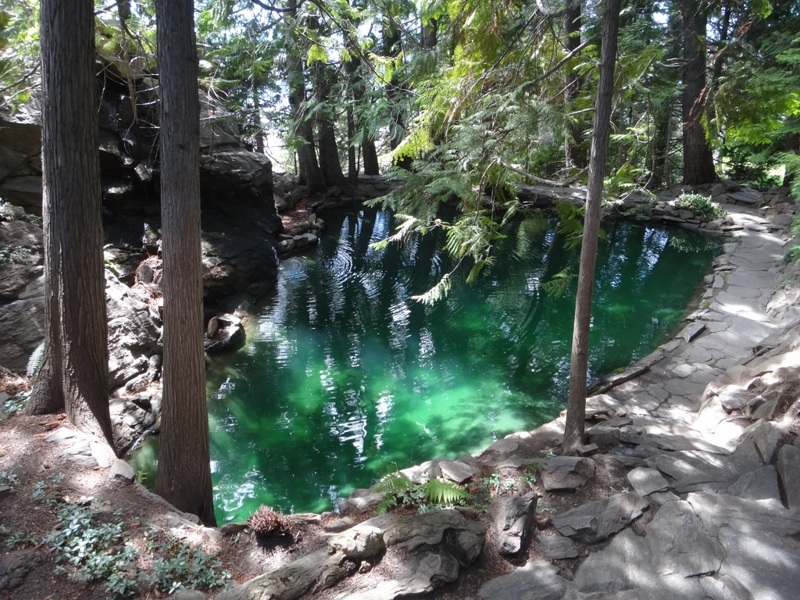 It was created by Herman Ohme in 1929 and people around wanted to enjoy and share the beauty of his garden. So he charged money to deter these visitors. Didn't work out that way - now there are many visitors. 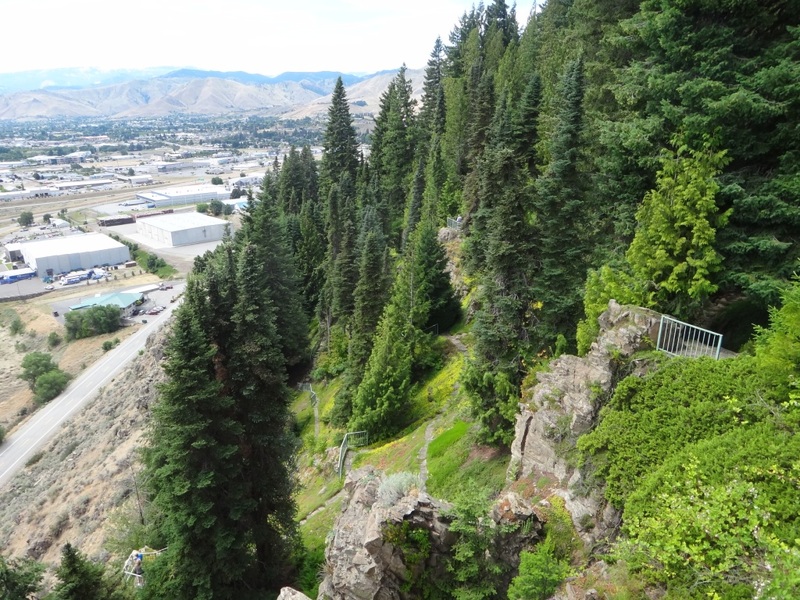 The unusual feature about this garden is its location on a hillside and in semi-desert. Photograph 3 - How Ohme's garden crept along the hillside. Photograph 4 - Well what can we say? Anne cussing and cursing Neil to stay put and enjoy Ohme's creation. Photograph 5 - The wonders of the Rocky Mountain near a place called Goldbar. Not far from Seattle, Washington. 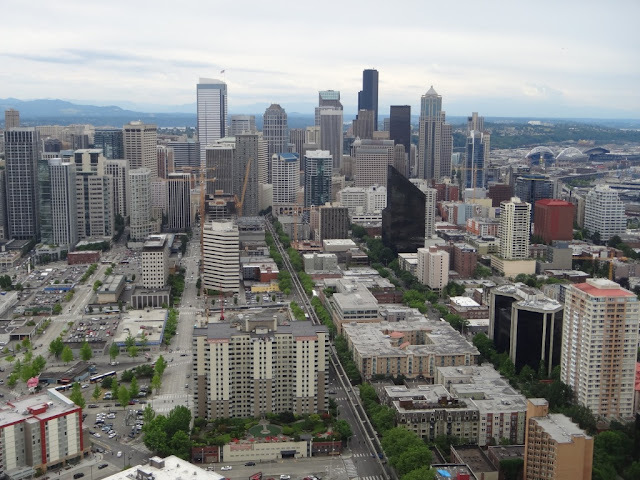 Photograph 6 - Downtown Seattle, Washington taken from the Space Needle (503 feet high). 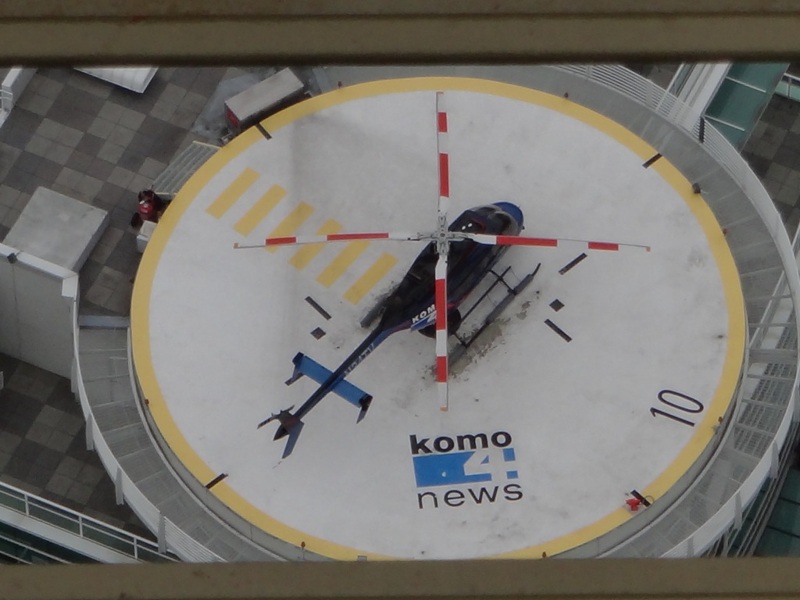 Photograph 7 - Looking down on top of a TV station from the Space Needle, Seattle. A chopper ready for a quick scoop over Seattle. 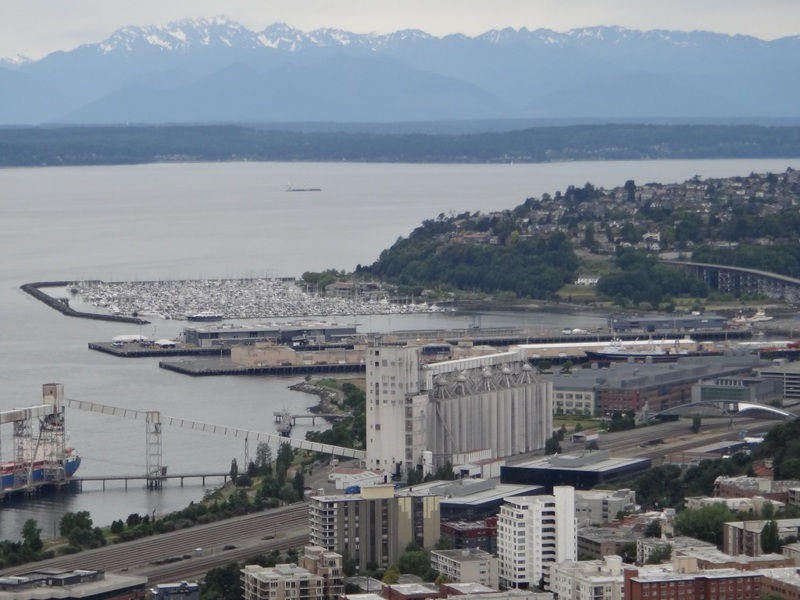 Photograph 8 - Puget Sound, Seattle taken from the Space Needle. Note the thousands of boats moored in the Marina. 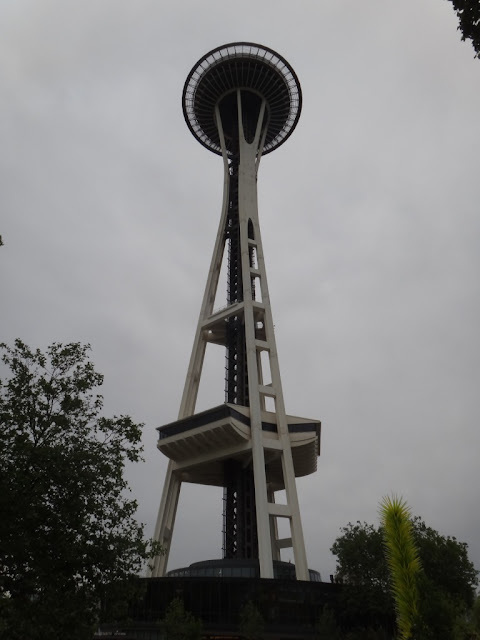 Photograph 9 - The Seattle Space Needle, built in 1962 for the Expo that Seattle hosted. It was a marvel and novel creation during that period. Photograph 10 - A free picture was taken when buying tickets to go to the top of the Space Needle. However, once on top we had to send it to our email address. Photograph 11 - At the bottom of the Space Needle was this huge fountain. 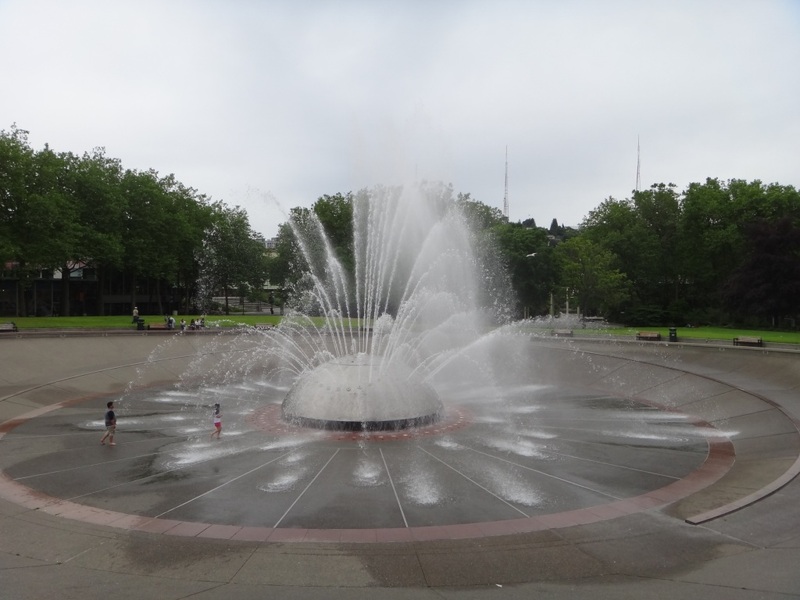 It was worth taking a picture of this water works. It was a six hour drive from Spokane to Seattle. We could of taken the expressway route which would have taken four hours or less. However, we chose to go through the scenic lesser road through desert areas and across the mountain range with more interesting sights. After leaving Spokane we drove past Fairchild Air Force Base where the big transport aircraft resides. Driving on we made it to Wenatchee and visited Ohme Gardens. This is well advertised in many tourist books to visit this creation in the middle of the semi-desert. We say semi-desert due to the lush and fertile river where framers grow cherries but the surrounding district is dry and treeless. Ohme Gardens is a creation started from poor and rocky soil. Herman Ohme began as a hobby and it turned out great. So great that many visitors invaded his property in the 1930's. To combat this Herman fenced it off and charged a fee. This made was not what he wanted....more visitors arrived with open wallets. So eventually he sold the property and currently it in the hands of the County estate. For us it was worth the $7 USD each to walk around the garden. 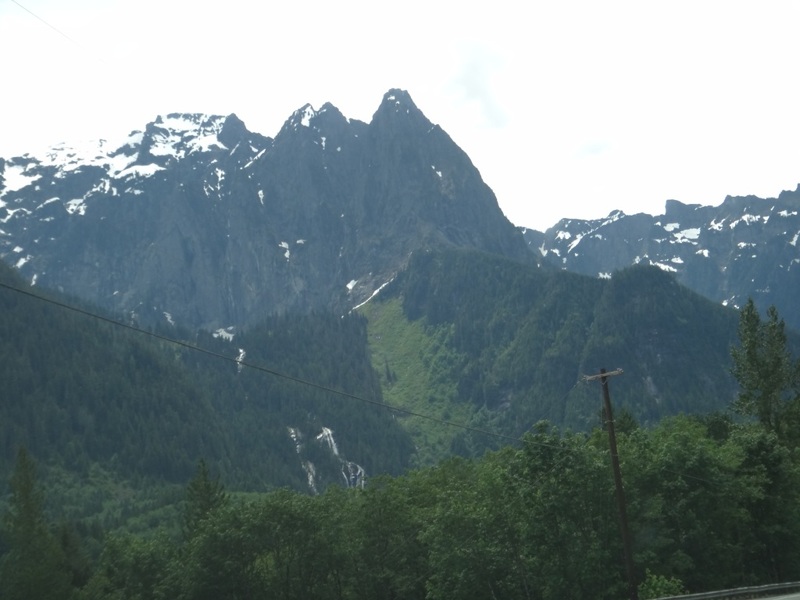 After our visit we drove across the Steven Pass to reach Seattle. Twenty klms or so before this city we entered the expressway and away we went. If it wasn't for our GPS (we love you Charlotte) we probably would be heading for Canada! Seattle is on Puget Sound and basically surrounded by water on all sides - almost an island. Therefore to reach the centre of Seattle we had to cross over long bridges. This is where the fun begins when driving without local knowledge makes driving a non-pleasurable experience. Our GPS kept saying, bear left (where's the bear!) turn right, do a U-turn, keep in the left lane........etc etc etc...... all in one kilometre. Well we arrive right at our hotel without too much stress. 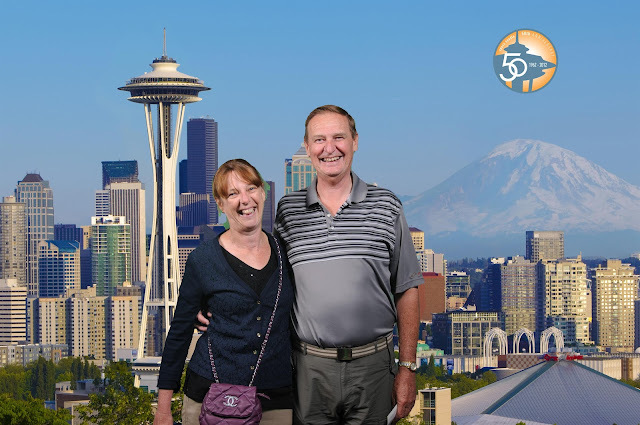 After we checked in we walked to the Space Needle and sussed-out the views from the top. We did heard that it will rain tomorrow and the next day so a visit this afternoon gave us some good views. Tomorrow we have a return ticket to Vancouver, Canada. So an early start for a three and a half hour rail journey north. We will have four hours in Vancouver before we catch a train back to Seattle. Hopefully returning at 8:45pm. Our Connie is now parked underneath the hotel for a few days. In her mechanical world she would be thankful for the well deserved rest. Until tomorrow - cheers.